A Pluvialis species some observers think could be a Pacific Golden-Plover is reported from Selody Sod Farm the past two days. See the eBird Somerset County Rare Bird Alert for details. The photos viewed this afternoon are inconclusive and offer no insight into the validity of the report. Only one record of this species is on the accepted records list for New Jersey. Updates, if necessary, will be posted on the mocosocoBirds twitter account, @mocosocoBirds and Facebook page, www.facebook.com/MocosocoBirds as they become available. No plovers were seen at Selody this afternoon but 4 Buff-breasted Sandpipers were viewed at the hazy sod farm (Jeff Ellerbusch, Simon Lane). 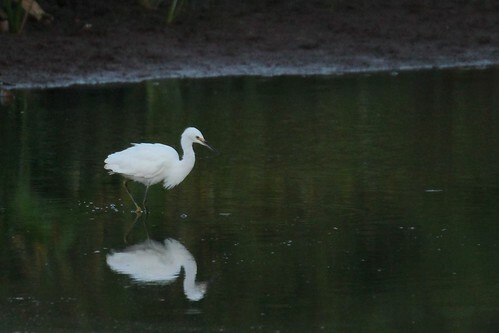 A Snowy Egret was seen and photographed at Finderne Wetlands yesterday, Sep. 5 (Mike Russell). The following photo is by Mike Russell. 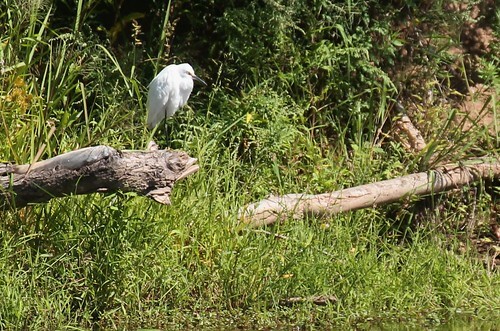 Today, Mike found what is probably the same Snowy Egret again on a log at Dukes Parkway Park (not to be confused with Duke Island Park in Bridgewater or Duke Farms in Hillsborough). These two reports are the only records of Snowy Egret in either Somerset or Morris Counties for 2015. Earlier in the week, 12 Common Nighthawks were at Glenhurst Meadows and another 5 were seen over Stirling Rd., Warren Twp. (Jason Denesevich on Sept. 3). Generally in recent days, migration has been meager, at best. of this page. One can follow mocosocoBirds at Twitter or link to @mocosocoBirds.